Every year, more Americans gather around their televisions to watch the Super Bowl than any other single broadcast. Last year, almost 112 million viewers watched the New England Patriots defeat the Atlanta Falcons for the National Football League championship. It was the fifth Super Bowl win for the Patriots. This Sunday, the Patriots will go for another. They will face the Philadelphia Eagles in Minneapolis, Minnesota. The Eagles have never won a Super Bowl, the championship game established in 1967. Fans and experts consider the Eagles the underdog in the big game, meaning the team is widely expected to lose. The lack of confidence in the Eagles is partly the result of Tom Brady’s great record. The Patriots quarterback has led his team to five Super Bowl wins. He was named Most Valuable Player in three of those championship games. Last year, Brady helped his team recover from a 25-point deficit and win the game. Many consider him the best quarterback of all time. Nick Foles is the quarterback for the Eagles. Foles had a poor 2015 season with the St. Louis Rams and thought about retiring from the game. Last year, he joined the Eagles as a back-up quarterback. When starting quarterback Carson Wentz injured his knee, Foles took his place. The team then encouraged its fans to wear dog masks themselves to the next game. 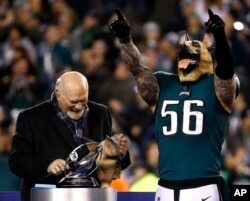 The “underdog” Eagles went on to beat the Minnesota Vikings by a score of 38 to 7. That win earned the Eagles its place in Super Bowl 52. The Super Bowl broadcast is not only about the game, however. Many who watch are more interested in the half-time entertainment and the funny commercials aired during the game. Singer Justin Timberlake is the star performer this year. It will be his third time on the Super Bowl stage. The Philadelphia Eagles and New England Patriots have faced each other once before in a Super Bowl. The Patriots won that 2005 NFL championship game, 24 to 21. Only one person who played then will return to the field this Sunday: New England Patriot Tom Brady. The Eagles are hoping for a different result this time. Hai Do wrote this story for Learning English. Caty Weaver was the editor.